Christmas Eve with tree candles lighted. Christmas in Germany is a special time, just as it is in all countries that celebrate it. It's the time that we remember our childhood Christmases and those of our children. And, of course, we remember the story of the birth of Jesus and the true meaning of why we celebrate it. For the children, it is a wondrous few days, and the weeks leading up to it are full of excitement and anticipation. I remember well how excited I used to be. In North America, the big day is on the 25th of December, beginning early in the morning with the children perhaps finding their stockings at the ends of their beds; then the opening of presents that Santa left overnight under the tree. Later in the day, a turkey dinner, stories, and finally off to bed. In Germany, Christmas Eve is the time when children receive their gifts, so that is a very special time for them. As I write, this is Christmas Day, the 25th, which here is more about the wonderful dinner to come, visiting with friends and family and perhaps going for a walk in the afternoon. The 24th is the day for Germans. That is when the children are kept occupied while Mom and Dad get everything ready for late afternoon. Grandparents or an older sibling will take the little ones out for a walk while the tree is being decorated and presents put beneath it. Before the tree and the presents, though, will be supper, and in Germany there are as many traditions regarding this meal as there are mothers; however, each area of Germany does have similar traditions within the area. The meal is nearly always simple, as what child can sit for long knowing the Weihnachtsmann (Santa) has left the presents already? In our area of Baden-Wuerttemberg, it is often Schaeufele (lightly smoked pork shoulder) with potato salad. Others have a fish dish, such as carp or salmon. When Hans was a child in Brandenburg, Germany, their Christmas Eve supper was wieners (made from pork and beef) and potato salad. Our traditional Christmas Day dinner is goose. Both of us grew up having that; he, in Brandenburg, Germany; I, in Prince Edward Island, Canada. During my children's years it was mostly turkey, but I always loved goose. In Germany, it is called "Gans" and many have that today--but not everyone. Good friends were having duck; others, beef or fish. At right, this year's goose, just out of the oven. The wine: a 1999 Chateauneuf-du-Pape. A good wine, either a Burgundy or Cote-du-Rhone, compliments a goose dinner. In 2005, our friends, Jean and Bev, arrived from Canada, visiting for a couple days before heading to a small village in Burgundy for three months. They had rented a Gite (a holiday house) and lived next to the owners, whom they got to know well. Jean and Bev decided to treat these new friends to a Canadian Thanksgiving dinner (it was October). But to find a turkey! They couldn't find any in the area (lots of Bresse chickens, but no turkeys!). So they drove all the way back to Germany (about 3 to 4 hours) and bought one here--or so they thought! 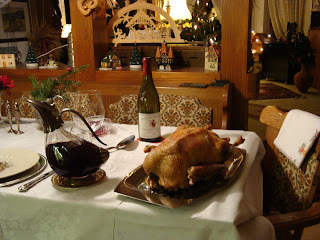 We got a frantic phone call from Burgundy: "We didn't buy a turkey, but a goose!" (Their French friends knew the difference!) Jean and Bev hadn't known the German word for turkey so bought what they thought was one. (In Deutsch, turkey is called a Pute or Truthahn.) A cry for help: "How do you cook a goose?" So, by fax to their landlord's machine, we sent off the directions on how to cook a goose. According to them, everyone loved it! But they haven't lived this down and won't as long as we keep bringing it up! Several weeks later, Jean arrived back along with other good friends arriving from Ontario, Ron and Nancy, for Christmas and New Year's. They stayed at a wonderful Gasthaus we know well in the hills. We asked Herr Burger and his daughter Ruth Moser if they would consider making Christmas dinner for the five of us, a goose with all the trimmings. "Naturlich!" they replied. So on Christmas Day, the 25th, the first time ever for us eating at a Gasthaus for Christmas, we had the most memorable Christmas goose dinner ever. It was fabulous! The goose was perfect and the gravy superb (lots of cream); the potatoes were pureed and so beautifully served I can still see them in the huge bowl; the platter of mixed vegetables was outstanding as was the red cabbage. And so was my dressing. I had asked if they would mind if I brought a casserole of dressing along. That was fine with them. They later told me that they had loved it, too. Canadian stuffing or dressing is different from the German and anyone who has had it here, loves it. 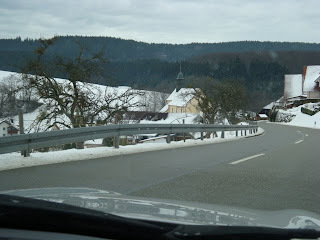 The picture above is of the small village of Biederbach where we were earlier this week and where Jean, Ron and Nancy stayed in 2005 at the Deutscher Hof. That is where we had our remarkable goose dinner. 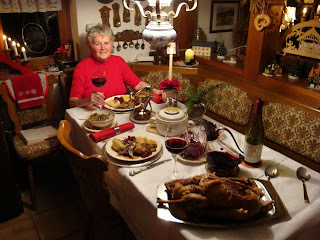 Many Germans go to a Gasthaus for Christmas dinner. As the Gasthauses are all very busy on the 25th, it's necessary to reserve well ahead. (On the 24th, nearly all Gasthauses close by 2 p.m. and some do not open at all that day.) Many Germans cook at home of course and have family members join them. As I was writing this, our goose was in the oven, the stuffing inside it, not in a casserole. Our Christmas dinner and me! Along with our goose, I make pureed potatoes. I boil them along with a couple of garlic cloves. Then, when ready, I mash them, along with the cloves of garlic, adding lots of unsalted butter (butter is the secret). Hans makes red cabbage which goes perfectly with goose or game dishes. He also makes Kartoffelkloesse (dumplings) and watches over the cooking goose. We never get rid of the goose fat; it's great to use in cooking later on when making something else. I remember my mother saving it, and I think she used it for making buns. Hans likes it this way: Once the fat congeals and hardens, what is left can then be spread on bread. It's certainly not the healthiest thing, but he loves it. I never eat it that way myself, but it's great to add to gravy another time. Gaenseschmalz or goose fat, on rye bread, sprinkled with salt, is a delicacy. Along with the meal, we have my homemade cranberry sauce, which I make every year to give as gifts and to enjoy during the year. Tried to post a comment and it didn't go through. Will try again. I enjoyed your story about your friends buying a goose instead of a turkey. I can imagine the panic they must of felt once they discovered their mistake! Your pictures of your Christmas Day dinner are lovely. The red sweater looks very nice on you, nice and festive too. I didn't realize that Germans go to a Gasthaus on the 25th for a Christmas dinner. Maybe during my time there as a child we didn't go out.